This bay contains a bunch of spaceships that crashed and burned fiercely when playtested. Missile movement must be re-worked - missile movement should probably drop to 1 square. Consider dropping all field effects to 2 squares range. It's very possible that this game can only be played "realtime". movement, ships may deflect attacks on neighboring ships, and expended missiles may be replaced. Destroy both your opponent's motherships to win. Click on above picture to get preset. The setup needs to be changed. The one given is an inside joke - it comes as close as I could get so far with a game design to spelling out : 1-D nerd. Neen[er,neener, neener!] but stops after "neen". Put all 16 pawns in the back row. Put the kings in the 2nd row, next to the rooks - not sure whether inside or outside the rooks yet. But it should be one of the 3x2 series - games played on "3" boards - 12x16 being 3 times the size of 8x8 - with 2 complete sets of chesspieces. It's a nice theme, now it needs a nice game to go with it. Each player has 2 kinds of pieces, ships and missiles. All ships have a large side/icon and a small side/icon. At the beginning of white's movement [phase 1] and at the beginning of black's movement [phase 5], all pieces are turned large side up. This indicates the piece hasn't used its "special power" yet. When it does, the piece is flipped to its little side to indicate it can no longer use its power until after the next ship movement phase, when all pieces are flipped to their large icon side. Mothership - royal piece - king [K] - This piece slides 1 or 2 squares. It may not jump. It may change direction during its move. It may not make a null move [move off and then back onto its starting square]. May load an adjacent missile [pawn] into an adjacent gunboat for immediate firing during the missile phases. May close with, board and capture an enemy ship by moving onto the same square as it. The enemy ship is captured, not destroyed. It changes color and is placed in any empty square adjacent to the capturing mothership. Motherships cannot capture enemy motherships. Instead, when one mothership attempts to capture another, both are destroyed. squares toward itself. It may neutralize one pressor or its effects within 3 squares. Pressor - Elephant [E] - Move: slides up to 3 squares diagonally. The pressor field pushes a piece away from itself. It neutralizes one tractor or its effects within 3 squares. Immobilizer - kNight [N] - Move: a standard knight's move, leaping intervening pieces. Its 2-square range field reduces a piece's [remaining] movement to zero. It neutralizes and is neutralized by another immobilizer within 2 squares. Gunboat - Rook [R] - fires missiles [pawns] that the mothership loads it with. Moves as "Q3", a 3-square sliding queen. May ram enemy ships to destroy them. Must stop on the destroyed enemy piece's square. If a gunboat rams another gunboat, both are destroyed. If, at any time during a missile movement phase, a gunboat is adjacent to a mothership which is adjacent to any missile, friendly or enemy, the gunboat may fire that missile at the opponent's back rank. The mothership picks up the missile, and passes it to the gunboat. The gunboat then fires it 2 squares. The missile is fired into any 1 of the 3 squares in the next rank [closer to the opponent's back rank] adjacent to the gunboat, then travels 1 more square "forward". Missile - Pawn [P] - Exists in 2 states: Fired and Unfired. Fired pawns move 2 squares directly "forward", toward the opponent's back rank during each missile movement phase. If one hits a piece, both pieces are immediately removed from the board. 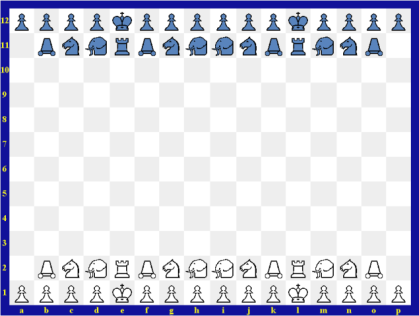 All pawns start out Unfired, on the back rank. An unfired pawn may not move. the missile can be loaded and fired at the other side's back rank immediately. discretion. A missile is replaced if it hits an enemy ship or goes off the board, or collides with [hits or is hit by] an enemy missile in the missile movement phase. If it collides with a friendly piece or is destroyed by beam fire, it is not replaced. 1] White moves 1 - 4 ships. 2] Black initiates force combat. 3] All fired missiles move 2 squares straight ahead. 4] White initiates force combat. 5] Black moves 1 - 4 ships. 6] White initiates force combat. 7] All fired missiles move 2 squares straight ahead. 8] Black initiates force combat. are turned large side up. Then black may move [up to] 4 pieces. Then beams. Then missiles. Then more beams, and the turn is over. maximum of 4 pieces moving, depending on what group is chosen. even if [some of] those pieces were moved in the previous turn. the gunship, or one gunship rams another gunship. enemy ship or by hitting a friendly piece, it is not replaced. 3] When a mothership captures an enemy. area centered on the piece. There are two types of force combat, beam and field. A player must specify whether a piece is using beam or field combat. Tractors and pressors may perform field combat. Tractors, pressors and immobilizers may perform beam combat. Tractors, pressors, and immobilizers all project a field which affects enemy movement.A single field attack will move an unprotected piece 1 square by pushing or pulling it. One piece may be the subject of several field attacks and get moved several squares during the force combat phase.Force *field* combat is not strictly sequential. An enemy force field attack may be nullified by a friendly response in the immediately following action/"turn". The response may target [ie: reach] the square the piece was moved from in the previous action. The response results in the moved piece being replaced in its original square by its owner. All fields are able to affect pieces directly behind other pieces. respectively, the piece will wind up in. Facing of the target piece is never affected by a field, no mater how far it may be moved. Any ships forced off the board are destroyed. destroy that target. The piece is removed from play. All beams are selective and unblockable by intervening ships within their range. the firing ship or the target. Force *beam* combat is strictly sequential. Any result, ie: a destroyed ship, from a force beam attack is applied immediately, before the opposing player gets a response. Any destroyed pieces are always removed before the next player action. through them unless the force fields are neutralized. during the friendly movement phase. If there is more than one enemy ship projecting a field into a square, each individual enemy ship must be neutralized by individual friendly ships that can't move in that turn. missiles. Enemy fields do affect friendly missiles and vice versa, just like they affect ships. Enemy fields may be neutralized by friendly fields, allowing missile movement. This game has several influences. The main game influence is Ultima; this is sort of a different version. The multi-move feature is from wargames. The inspiration is, of course from bad movies. It was originally conceived for face-to-face play, but it was impossible to translate that original game into a playable game courier version without major changes. The initial idea was that players alternated single moves with unlimited forcefield and beam combat in each square they traversed. So a single piece's 3 square movement could entail a dozen rounds of movement and force combat. This is not practical for a play-by-mail game that you want to finish in less than several years. So the idea was translated to play-by-mail rules. This is the result so far. I hope you enjoy it. This is an experimental game. It may well need to be tweaked. [Bit of an understatement there, be a miracle if it didn't.] The missile rules are somewhat worrisome, and also somewhat sketchy. And I'm sure the other rules will bring out the usual group of questions, if not questioners, to help me make them comprehensible to all, or at least within reach of the handful of people who have read this far. Finally, there is the very real question of: "Is this chess?" The best answer I can give is that it is chess-like. This is an attempt to fix the broken variant Spacewar. After consulting with Joe, it proved a failure. Spacewar was the precursor to Chieftain and Joe's other multi-move games, and so was to be similar to it. However, if you want to play that kind of game, just play his newer ones. Meanwhile, I think this is a pretty interesting variant in itself. Sorry I took so long to get to this. It's a complete mistake to say this modification is a failure. :) I've argued before and will again that a game must be judged on how it plays. Based on that, my original is the failure - that's why it's in the garage. While I haven't played his modification, it is reminiscent of some old wargames, and moreso some naval combat games. I used to play and enjoy those games when I was much younger, and I see no reason why those who enjoy these sorts of games shouldn't like this one. I would suggest using a board with over-large squares and tokens to keep track of each piece's values, as the likely easiest non-computerized way of playing this version. Enjoy. Tractor (Queen) - 3 Health, 9 Ammo - Moves one or two squares in the same direction without jumping, or brings one piece one square closer or farther along movement lines or to the same square, or immobilizes one adjacent piece and no other pieces until Tractor moves, is captured, or stops immobilizing. Defender (Rook) - 9 Health, 6 Ammo - Moves one or two squares orthogonally in the same direction without jumping, or fires at a piece in its movement lines without skipping a piece. Scout (Knight) - 3 Health, 3 Ammo - Moves one square orthogonally, then one square diagonally in the same direction, jumping, or fires at a piece in its movement lines. Shooter (Bishop) - 6 Health, 9 Ammo - Moves one or two squares diagonally in the same direction without jumping, or fires at a piece in its movement lines without skipping a piece. Medic (King) - 9 Health, 18 Repair, 6 Supply - Moves one or two squares in the same direction, or repairs or supplies one adjacent piece or self. Base (Colored Square) - 1 Health, 36 Repair, 72 Supply - Supplies occupying Medic. White and Black alternate moving one piece each turn, White first. Ammo is used for either forcing or firing. Both deplete ammo. Forcing depletes 1 Ammo each time a piece is forced by a Tractor. Firing decreases a fired upon piece's Health equivalent to Ammo spent, an integer at discretion of the firer. Supply increases a piece's Ammo equivalent to Supply spent, an integer at discretion of the firer. Health is depleted by firing or crashing. When a piece's Health becomes 0, the piece is captured. Crashing happens when a piece moves into the same square as another piece. When pieces crash, the piece with less or equal Health is captured, and the other piece has the first piece's Health subtracted from its own. Pieces cannot crash into Bases. Repair increases a piece's Health equivalent to Repair spent, an integer at discretion of the firer. You win the game if you are the first one to capture or move onto all enemy Bases.